Disclaimer: I'm still a bit of a pinball newbie but I know my way around electronics. I specialize in arcade/CRT repair and have done the odd pinball repair. A friend of mine picked up a non working Space Shuttle for a decent price. The previous owner bought it from a vendor "when the game was 8 years old" but apparently has been sitting in their basement not working "for at least 20 years". The aftermarket mylar is in horrible condition but the cabinet, backbox, playfield (besides mylar), and electronics are in good physical condition. No oxidation around transformers, no battery rot, no sketchy/hacked/disconnected wiring. The few repair jobs to the MPU appear to be done well (RAM replaced, small transistor, all pins reflowed). First try we get playfield GI and backbox lights but nothing else (no playfield/gameplay lights, no attract, nothing on all displays, no coinup). The MPU was reporting Error code 7. After checking all fuses (nothing blown), removing/inspecting MPU, reseating all connectors and chips in sockets, the MPU boots (code 0). The game passes the Sound/Voice test with SW2 on the MPU. However, upon reboot the game still appears in it's frozen state (only GI and backbox lights) and won't coinup until SW1 is pressed on the MPU. After SW1 is pressed the game does a quick audible blip/chirp and then the playfield lights comes alive with coinup, gameplay & sound working (couple faulty switches, nothing major) but without displays. The displays never show anything at any time. Checking schematics and testing displayboard power input while disconnected I get -93v (both lines) and +5v, but the positive HV line is only at +55v. I was running low on time so took the main Power board home for further inspection (didn't have proper tools with me) and will look at it tomorrow. Everything after F1 on the Power board appears display related so I'm hoping to find a problem there. My main concerns are; why does SW1 need to be pressed for the game to work, is there a known issue regarding the displays not working, and what is the best way to go about removing a mylar overlay? The mylar is cracked, bubbling, peeling/flaking, but luckily doesn't appear to have damaged the playfield artwork. I can see the faint outline where the factory mylar once was and the replacement is smaller/shorter at most edges. Once removed, what is the best approach to protecting the old playfield? Your displays won't work on 55v. I bet you it would boot if with the coin door open you turn it off and back on again in quick succession. If your friend got this at a "decent price" and doesn't mind putting a bit of money into it, go with a Hardtop for the playfield. 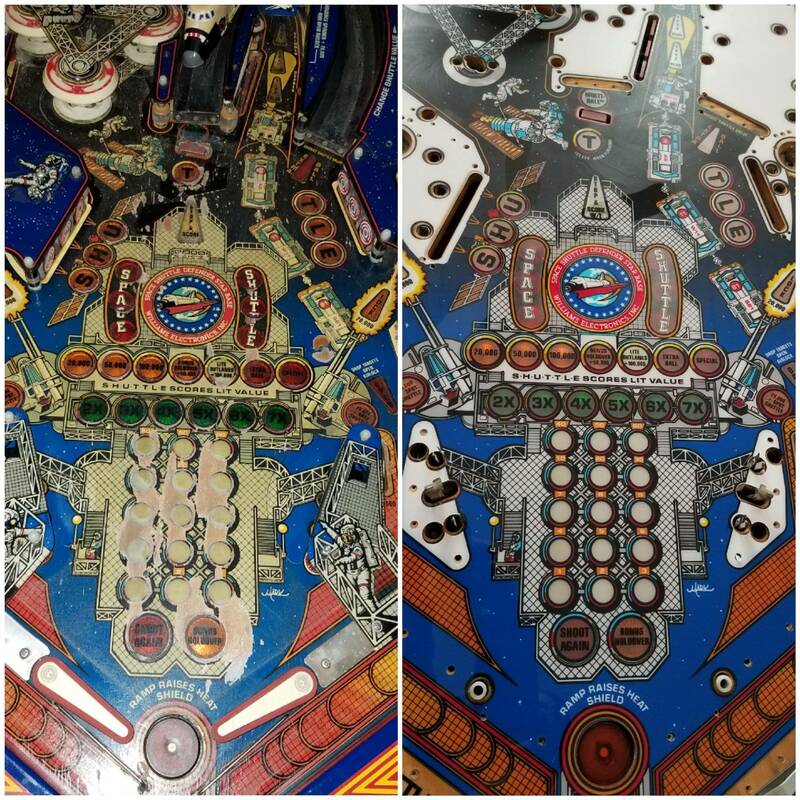 Its basically a plastic overlay with new art that covers the old playfield. You would need to remove all the topside pieces (not as hard as you think) and sand the inserts. Looks AMAZING when finished!! Plus it gives you a chance to thoroughly clean everything. Just as mentioned above is a good start. Since you do not have the proper voltage to the displays, you would not see it booting up in audit mode. Which either the MPU batteries are missing, failed, or the batteries were replaced with the power off. Even a damaged battery holder may be a problem. Post a picture of the MPU board so we can look for any battery alkaline damage. This repair got pushed to the 'back-burner' for a little bit. Thanks all for the replies. Upon inspecting the Power Supply Board, I found R4 to be blown open and suspect Q3 to be bad (not shorted or open, but voltage-drop readings seam very low). Replaced R4 and the electrolytics I had on hand (all but C1, C4, C10) and fired it up. Most displays work but strobe on & off. Player4 display comes on for a split second at power-up but immediately goes dark and never shows life again until next power cycle. All other player displays and ball/credit display show correct numerals (while strobing, and you can see a single zero for a few milliseconds before it displays the correct numerals, then goes dark and repeats the cycle). Getting -99v, +5v, +56v at the connector - basically the same as before but the negative voltage is dead stable now (it fluctuated around -93v before). Good news is there's correct communication between MPU and display driver board, poor board is just starving for power. I have a Mouser order coming up, so will replace remaining electrolytics and order replacements for Q1 through Q4 just to be safe. Looks like some of the original parts are EOL but I found compatible replacements. We figured out the issue with the game not starting until MPU SW1 is pressed, no batteries. A very poor oversight on my part. There is no corrosion whatsoever on the MPU. Minor oxidation on the battery holder contacts (simply from age) but that was it. The batteries we pulled from the unit, although old & dead, looked brand new. We got lucky! Will replace with a remote battery holder or memory capacitor. I have looked into the Outside Edge Hardtop and really like the idea. It would definitely save all the tedious work removing the old mylar as the playfield needs to be sanded for the hardtop anyway. The machine was only $500 CAD (~$375 USD) so this looks like a good option.